Fatal crash rates for 16- and 17-year-olds — the group of drivers that has long been considered one of the riskiest to provide auto insurance to — was on the decline between 2004 and 2008, according to a new report from the Centers for Disease Control and Prevention (CDC). 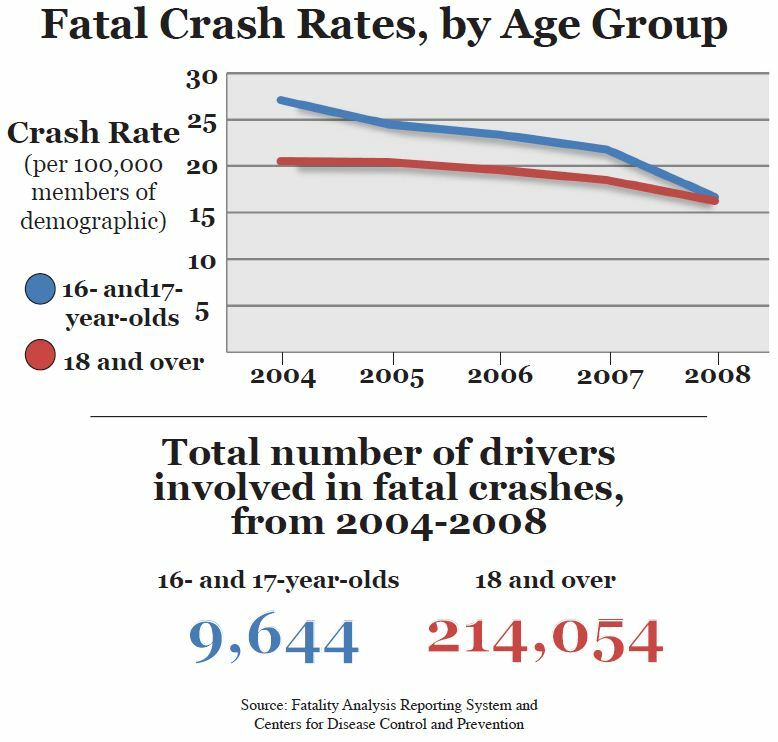 The CDC report showed that, during this five-year span, the fatal-crash-involvement rate for the youngest drivers dropped by 38 percent, with the greatest year-to-year drop occurring between 2007 and 2008. New York and New Jersey shared the lowest crash rates for the five-year period, with only 9.7 16- and 17-year-old drivers involved fatal crashes per 100,000 people. Wyoming had the highest rate, with 59.6 per 100,000. To at least partially account for the downward trend that began in 1996, the CDC points to the implementation of state graduated licensing programs (GDL), which postpone unrestricted licensing privileges until the driver has had a larger amount of experience behind the wheel. In an editorial note accompanying the report, the author suggests that New York and New Jersey may serve as examples of the effectiveness of stricter licensing systems. New Jersey remains the only state with a minimum licensing age of 17, and teens in New York City are not allowed to drive until 18-years-old, unless they take state-approved driver education courses. Some government officials have proposed stricter requirements on the nation’s young drivers. The STANDUP Act, recently introduced to the U.S. Congress, would establish a uniform federal standard for graduated licensing programs. But, despite the positive findings, statistics still show that teenage drivers remain the riskiest. According to the CDC, teens have the lowest rate of seatbelt use, and drivers age 16-19, per mile driven, are four times more likely than older drivers to get into a crash, keeping auto insurance for teenagers an expensive commodity. The report also indicated that males made up a disproportionate amount of the 16- and 17-year-olds involved in fatal crashes (65 percent), lending more credibility to auto insurance providers’ charging some of the highest rates to cover this demographic. Benjamin Zitney has been covering the auto insurance industry for the past 2.5 years. Before coming to Online Auto Insurance News, he produced an extensive company history of the 30-year-old California Joint Powers Insurance Authority and worked at the Cal State Long Beach Daily Forty-Niner as a reporter, copy editor and news editor. Copyright 2019 - Autoinsurance.com. All rights reserved.